​The first "Peruvian hatun charango", with seven rows of strings, was designed by Federico Tarazona and constructed in Lima by luther Fernando Luna. It has six rows of single strings, and one doubled row tuned to the octave like the traditional charango. This modern variation on the traditional Andean charango has a 370 mm tuner for the five first rows and another of 380 mm for the two new rows, making this instrument groundbreaking. This characteristic also distinguishes it from other seven-string charangos. 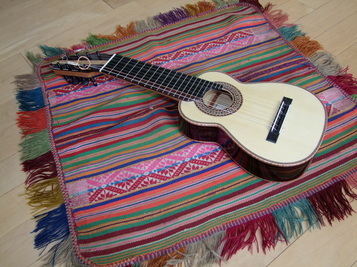 The Peruvian hatun charango, also called the "Grand charango", has the form of a traditional charango in which two supplementary rows have been added in order to allow the interpreter a larger tessitura to satisfy his musical needs—a final characteristic of the Bolivian hatun charango, or the "five rows of doubled strings grand charango". The ease of playing the hatun charango allows accces to a universal repetoire of music. A great number of adaptations of pieces for lute, vihuela, guitar and violin are easily accessable, and, of course, original pieces are easily and frequently composed for the instrument. In reality, Federico Tarazona dedicates the majority of his professional activities to composition, performing, and research in the construction of the charango; he first received training from Fernando Luna and later from guitar maker Jean-Noël Rohé in Strasbourg, France.